Homemade granola bars and even plain old granola are one of those “on the go” snack foods that are perfect for pretty much any situation. A quick and healthy breakfast, a mid-day energy boost at work, an after-school snack for your kids, or while camping with the family. 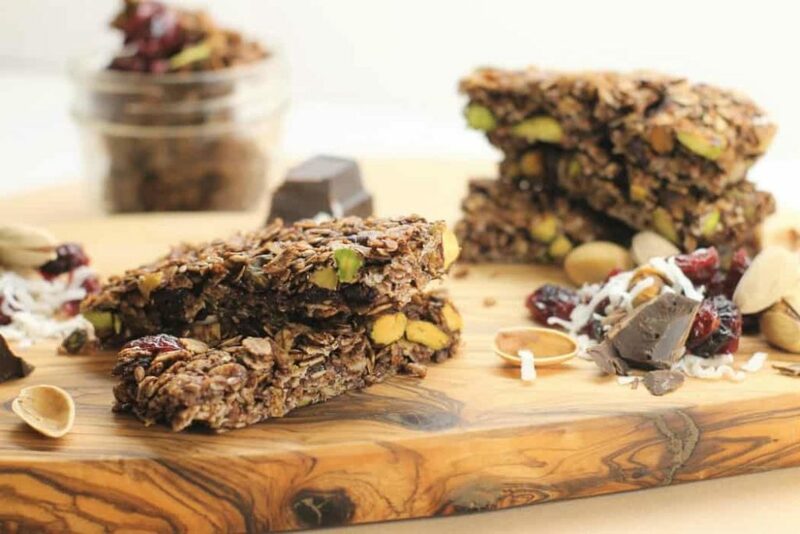 These gluten free granola bars are loaded with chocolate, dried cherries, and pistachios. Best of all they are easy to make! Are All Granola Bars Gluten Free? The simple answer is no. While it is true that rolled oats them selves do not contain any gluten, many store bought varieties can not guarantee their facility is gluten free or the product contains gluten in another ingredient. Thee best solution is to make your own homemade gluten free granola bars with ingredients you can trust are gluten free! Are Granola Bars Even That Healthy? You might be surprised to learn that not all store-bought granola and granola bars are as healthy as you are lead to believe. 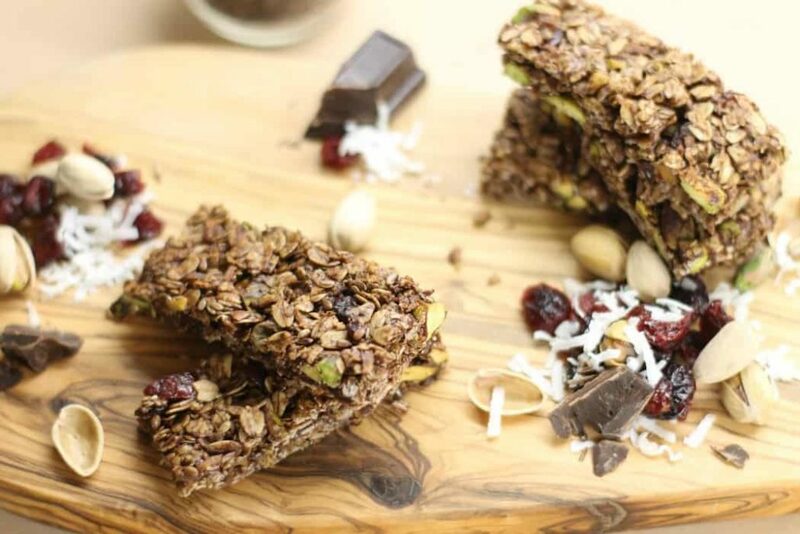 Store bought granola bars are often dipped in rich chocolate or a variety of other coatings, which makes them generally very high in sugar and loaded with various preservatives to maintain texture and freshness. The first “healthy” leading brand of granola bar I looked at on the shelf consisted of over 25% sugar. That’s mind blowing if you stop and think about it. A quarter of that granola bar you’re about to devour is made of sugar, (probably not healthy sugars at that). This makes run of the mill granola bars very tasty and appealing. 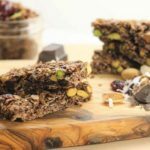 This gluten free granola bar recipe is very straight forward and is filled with lots of tasty treats to give you a quick energy boost. You can use roasted or raw pistachios depending on what’s available to you, or swap out the pistachios for other nuts! Mix the oats, chopped pistachios, unsweetened shredded coconut, salt, and flax seeds together in a bowl. 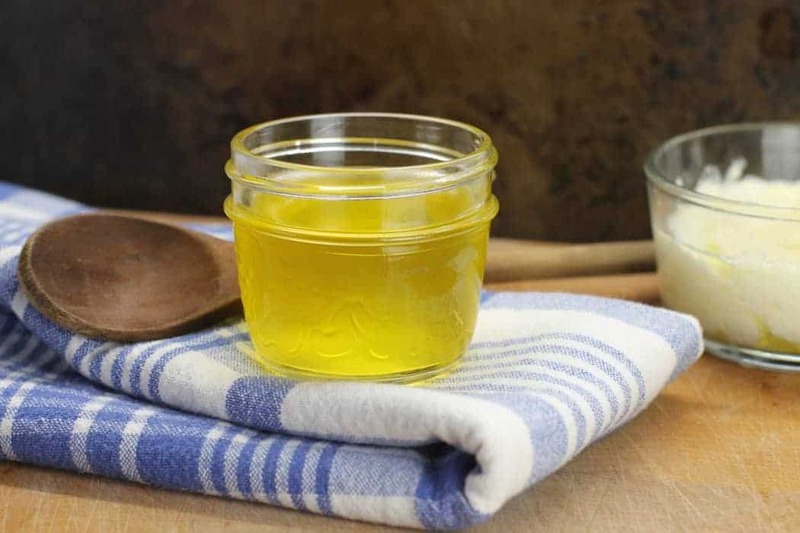 In a saucepan melt the coconut oil, brown sugar and honey until just liquid. Pour over the dry ingredients and mix until well coated. Beat 2 egg whites with the vanilla extract until frothy and mix into the other ingredients. Spread the granola bar mixture onto a parchment lined cookie sheet and spread out the mix until it evenly covers the surface of the pan. With wet hands, lightly pack it down. Bake on 300F for 20 to 30 minutes. The mixture will still look kind of wet and soft, don’t worry it will harden and crisp up as it cools. Let the pan cool for about 5 minutes and then cut the sheet of granola into bar sized portions. Be careful not to burn yourself as the mix may still be slightly hot. 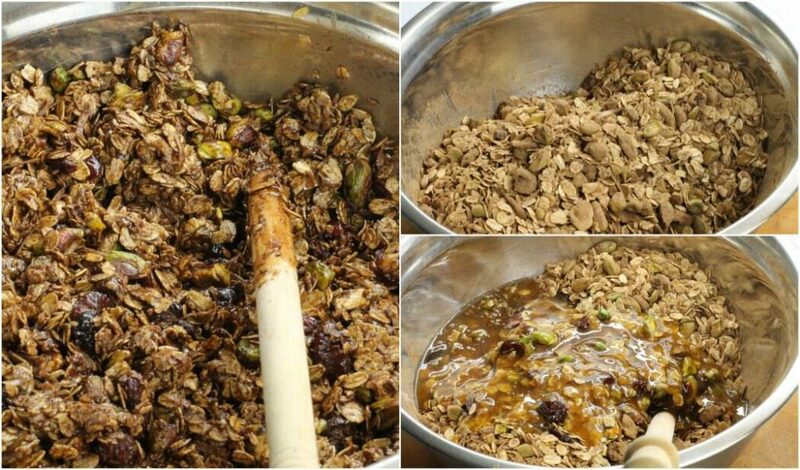 Let cool until completely set and then separate your homemade granola bars. These tasty pistachio, cocoa, and cherry granola bars are easily packed up and able to be enjoyed wherever ever you are. The ingredients can be fairly easily swapped out as well for other nuts, dried fruits, and seeds. Change things up by adding some chia or even spices like cinnamon to the mix! If you want to make no-bake granola bars follow the recipe above and simply omit the egg whites and instead add some peanut or other nut butter until you can form firm balls with your hands. After mixing thoroughly, pack the mixture into a cookie sheet and cover with saran wrap and let chill over night until solid. Cut and store the bars in the fridge. These healthy gluten free Granola Bars are easy to make at home and cut out many of the unhealthy sugars and preservatives found in commercial brands. Full of chocolate, dried cherries, and pistachios, adults and kids alike will love them! 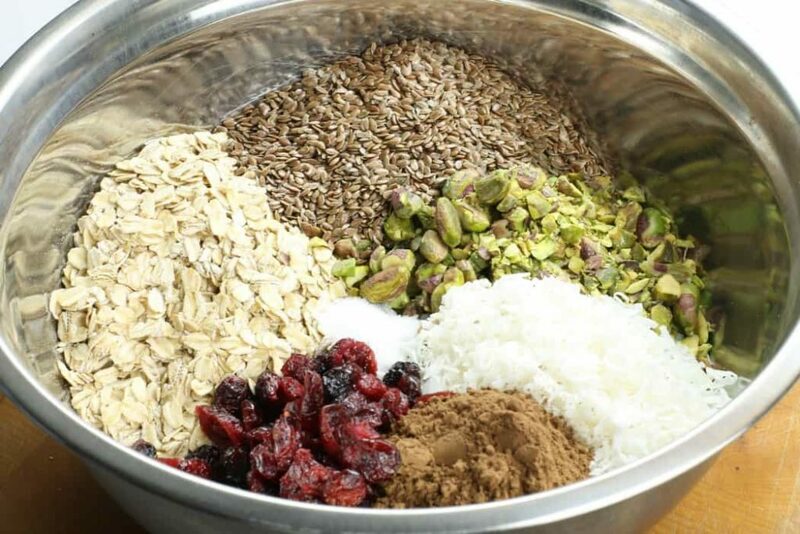 Mix the oats, chopped pistachios,cocoa, cherries, unsweetened shredded coconut, salt, and flax seeds together in a bowl. 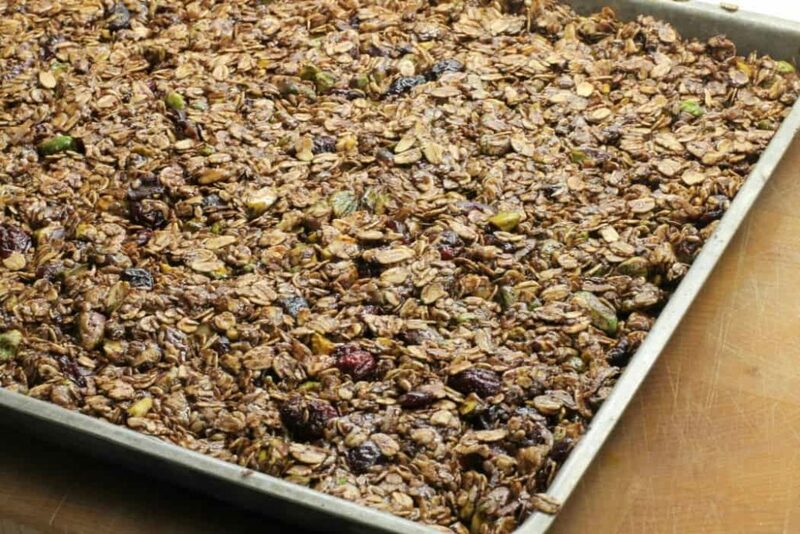 Spread the granola bar mixture onto a parchment lined cookie sheet and spread out the mix until it evenly covers the surface of the pan. With wet hands lightly pack it down. Bake on 300F for 20 to 30 minutes.The mixture will still look kind of wet and soft, don't worry it will harden and crisp up as it cools. Let the pan cool for about 5 minutes and then cut the sheet of granola into bar sized portions.Let cool until completely set and then separate your homemade granola bars. Recipe doesn’t say when to add cherries and cocoa. I’m assuming with dried ingredients??? My apologies! I’ve updated the recipe to include when these should be added. I liked your granola bars as soon as I saw them, and I am definitely going to try them, maybe switching the dried fruit to what I have in the pantry. I like having a snack in the afternoon or mid-morning, and these are just perfect! They are perfect for a quick snack! Switching out the fruit and nuts shouldn’t be an issue as long as the same amounts are used. 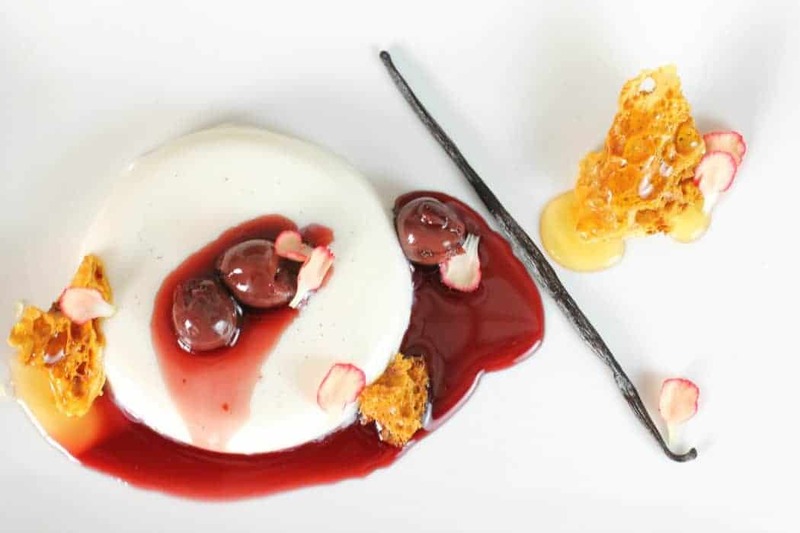 Pistachios and cherries is the perfect combination here! Homemade is definitely always best, if time allows! I think the trouble with the high sugar content in store-bought granola bars is that even though they’re a dessert, people see them as a healthy snack! Homemade is so easy and a million times healthier! Pistachio and cherries are perfect together- these look delicious, Markus. We can never have too many granola bar recipes! Your version sounds wonderful. I see the ingredients list in the blog post, but it doesn’t seem to be in the recipe at the bottom. If you hit the print button, the ingredients list is not there. Am I missing something?? Thanks for pointing that out Elaine. I’ll have it fixed shortly. These look amazing – all my favourite things in one bar! I know what you mean about the sugar content – I always look for the lowest amount of sugar when I buy granola bars for the kids, but they are all still so high in sugar! I will definitely be making there! I didn’t see it mentioned, but will they keep longer if you freeze them? They will keep longer frozen yes, though I simply cut them into bars and keep them in rubbermaid bins in the fridge.